Hello Drivers!! Thanks for taking the time to find out more about our company and the great driving opportunities that are available at Elite Carriers LLC! We strive to provide our drivers with a safe, friendly and professional atmosphere that encourages each of our employees and owner operators to perform at the highest level possible. We also understand the importance of family and make every effort to ensure that each driver is routed home at regular intervals. We are an over-the-road dry van company that also has regional and local work available. 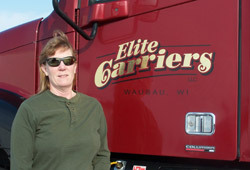 Elite Carriers LLC is committed to outstanding customer service and driver safety. If you are a professional and safe driver looking for a home, please stop in and check us out. If you are unable to stop in, you can fill out an online application.